The late Robin Sachs was tasked with the challenge of performing Jean Helion's moving account of his time imprisoned by the Nazi army. Sachs, of course, gives an engaging and sincere performance, putting listeners right into the trenches with Helion as he is captured and then escapes from a Nazi prisoner-of-war camp. Jean Helion, an accomplished abstract painter, had been living abroad in America, but a call to duty sent him home to France, and ultimately right into the Nazis hands. They Shall Not Have Me is a harrowing and unflinching look at one of modern Europe's most dark eras. 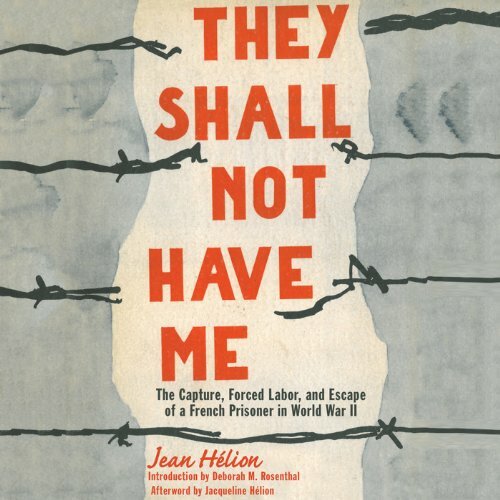 A moving and engrossing symbol of resilience and integrity, Hélion’s daring story of imprisonment and escape under the Nazi regime is now available in this stunning audiobook. Writing in English in 1943, after his risky escape to freedom in the United States, Hélion vividly depicts the sights, sounds, and smells of the camps, and shrewdly sizes up both captors and captured. In the deep humanity, humor, and unsentimental intelligence of his observations, we can recognize the artist whose long career included friendships with the likes of Mondrian, Giacometti, and Balthus, and an important role in shaping modern art movements. Hélion’s picture of almost two years without his art is a self-portrait of the artist as a man. ©2012 The special contents of this edition by Skyhorse Publishing, Inc. Introduction 2012 by Deborah Rosenthal. Afterword 2012 by Jacqueline Helion, 1943 by Jean Helion (P)2012 Audible, Inc. I've read a number of war stories both fictional, biographical and documentary style but this was the first book in which I had learnt of the plight of French Soldiers. The story is a little slow but does offer a fascinating glimpse into a whole new dimension to the war. love it. Most books regarding prison camps controlled by Nazi Germany deal with the Despicable treatment of Jews. It was interesting to learn how French POW's were treated. Who doesn't love a successful prison break story?.